The weather has been hot, hot, hot! We have been working hard at our real jobs and when Ray said that he needed an extra leader for the June laning trip it seemed like a good excuse to get out of the office. 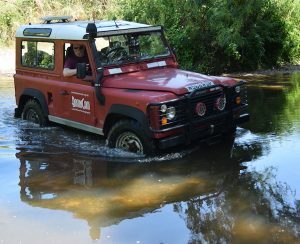 Yesterday we met at Sainsbury’s in Chelmsford and headed out for some local laning and then towards Braintree and Dunmow. Our second lane included a ford, we slowed to a stop ready to take a look before venturing in. Ralph was amazed when I said that I thought I had seen a horse disappearing behind the foliage! Sure enough there was a horse having a nice paddle. We waited for it to move on before cooling our tyres. It was a lovely relaxed day with another splash at Dunmow and finishing at the road ford at Walthambury – which had so little water we didn’t even make a splash.